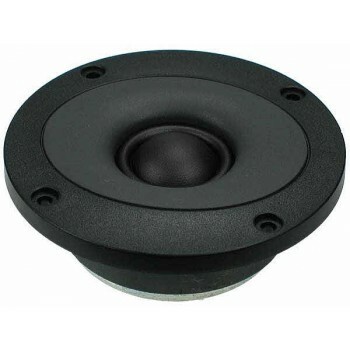 Seas 29TFF/W H1318-06 Tweeter is a favourite amongst speaker builders, featuring a High Definition precoated fabric dome with an integrated wide, precoated fabric surround. The precoated Sonomex fabric diaphragm allows very tight production tolerances and high consistency. Seas 29TFF/W H1318-06 Tweeter is a favourite amongst speaker builders, featuring a High Definition precoated fabric dome with an integrated wide, precoated fabric surround. The precoated Sonomex fabric diaphragm allows very tight production tolerances and high consistency, while the wide Sonomex surround gives low resonance and excellent mechanical linearity. The two part front plate forms a smooth, slightly elliptical wave guide made from elastomer, providing outstanding high frequency response and dispersion. Voice coil windings immersed in ferrofluid increase short term power handling capacity and reduce the compression at high power levels.